First it was Nishanth’s turn, since he is one minute older. At first he cried a bit at the touch of a stranger. But then he loved getting shot and posed for pics. Then it was Nakshatra’s turn. But the pacifier didn’t help. She cried a lot and scared the snip-man. I had hold her real tight to make sure she wouldn’t have any cuts. All went well in the end. 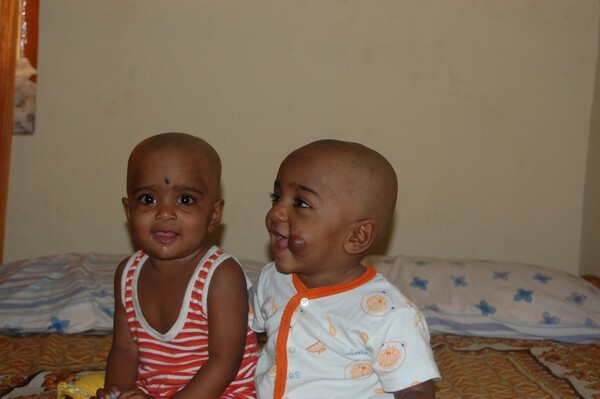 Now, they will sport plenty of new hair for the first birthday. You can tell that Nakshatra is quite attracted to lens. PS: Those of you with a keen eye for hair would notice that I got a hair cut too. Yep, I was tired with the long locks. PPS: I cant hold this pun any more. So here it goes, its going to get real pointy haired here for the next few weeks. Great sharing, Chandoo. My neighbor had a baby today (a very quick home birth), and it was amazing and humbling to be reminded of how small we all are in the beginning when I saw their new daughter. My own kids (aged 4 years and 6 years) have grown at about the same rate as i have lost my hair and memory, and so I can hardly comprehend that they were so small too. Great pics Chandoo. They look very happy despite the ordeal. Good memories with more to come!! Wonderful Pics Chandoo. It is a blessing to see such wonderful babies and a father as excited as you obviously are with your children. I wish you the very best and a long life of continued interest, involvement, and enthusiasm with the two miracles. I am sure they too will excel as grand as their brilliant father. God bless them, you have lovely kids. I can't get my two year old to sit in the hair chick's chair for longer than 60 seconds without her screaming. You've got 1 year olds getting their head buzzed. Well this what makes your blog really interesting.... nice pics Chandoo! Great Picture. Thanks for sharing. Adorable kids. I remember going thorugh this tradition long time ago with my cousins when they were young. We have our 1.5 yr old son had a buzz cut recently . Next time when I am in India, I would love to get this done. Did you get this done at Tirupathi? Your children are adorable. Thank you for sharing the pictures.